Product review: Flight in a Piper Cub – by Flyer John, 6 Sep 17 5/5 Excellent "The flight was given to me as an 80th birthday by my Son and Grandchildren. Very easy (to find) as the airfield was already known to us. The facilities were 1st class. (Staff and Equipment) First class with some other interesting aircraft in the hanger. As I had flown many times before it was all that I expected it to be. 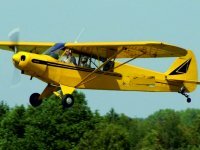 It was the first time I had flown in a Piper Cub. My experience many years ago had been in a Tiger Moth for about 40 hrs and in Jet Provest Mk 1 for getting on for 100 hrs, so I had a good idea what to do, and I was able to do the whole flight except for the take off and landing. It was very nostalgic. I would certainly do it again, maybe in a Tiger Moth. I have already recommended to my friends. (After the event) As much time as we wanted. My only regret was that my son who was taking the photos forgot get one taken of both of us with the Cub. (experiences4all)No previous experience with Experiences4all but absolutely no complaints "
Experiences4all says: Our pilots love enabling our more mature customers to relive their youth. Sounds like you had great day. The flight was given to me as an 80th birthday by my Son and Grandchildren. Very easy (to find) as the airfield was already known to us. The facilities were 1st class. (Staff and Equipment) First class with some other interesting aircraft in the hanger. As I had flown many times before it was all that I expected it to be. It was the first time I had flown in a Piper Cub. My experience many years ago had been in a Tiger Moth for about 40 hrs and in Jet Provest Mk 1 for getting on for 100 hrs, so I had a good idea what to do, and I was able to do the whole flight except for the take off and landing. It was very nostalgic. I would certainly do it again, maybe in a Tiger Moth. I have already recommended to my friends. (After the event) As much time as we wanted. My only regret was that my son who was taking the photos forgot get one taken of both of us with the Cub.